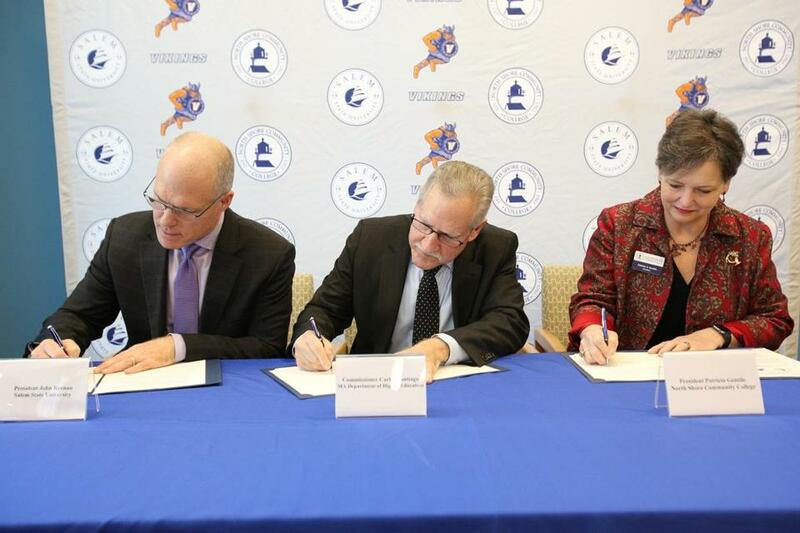 From left, Salem State University president John Keenan, Massachusetts Commissioner of Higher Education Carlos Santiago, and North Shore Community College president Patricia Gentile signing the transfer agreement. Years after attending college classes in Peru, Cecilia Gray, 30, tested the waters at North Shore Community College. Now a senior at Salem State University, she said her transition to a four-year university has allowed her to save invaluable time and money. It’s no secret that college costs are on the rise, and attending a community college can save thousands. Now, Salem State and North Shore are working together to make smoother transitions for students like Gray. The two colleges recently signed an agreement to create a partnership that makes it easier for community college students to move on to the four-year university. Nearly 32 percent of Salem State’s transfer students in 2017 came from North Shore, which has campuses in Lynn and Danvers. In addition, about 50 percent of students at both schools are Pell Grant-eligible, meaning they come from families with household incomes of less than $50,000. “We have a lot in common in terms of our students,” said Patricia Gentile, North Shore’s president. But current associate’s-to-bachelor’s programs, such as MassTransfer and the Commonwealth Commitment, are not one size fits all, university officials said. A committee made up of faculty and staff from both schools, government officials, and community members will work up the details of the agreement. One of the partnership’s goals is to help students from North Shore with unfinished associate’s degrees earn the credential after they transfer to Salem State. This option already exists, but university officials want to track and notify students who qualify to ensure none miss that opportunity. Having a credential such as an associate’s degree not only can encourage North Shore students to stay in school, Gentile said, but also helps working students earn better employment. North Shore students also could live on Salem State’s campus under the partnership. The committee will consider inviting students coming from North Shore to participate in Salem State’s extracurriculars, athletics, and maybe even study abroad opportunities. Gentile added that North Shore has some niche programs, such as aviation science professional pilot training, that could attract students from farther away if housing was available to them. Though this pipeline did not exist when Gray transferred from North Shore, she said university officials at both schools prepared her for the opportunities and rigor she found at Salem State. And even better, both schools are conscious of the challenges some students face. “Because I live so close, I never found it difficult to balance life,” said Gray, who lives in Beverly with her husband and child. Gentile said both schools strive to help students start and finish their degree without mounds of debt, and move on to meaningful employment. “It’s part of our commitment to create a seamless pathway, from birth to career,” Gentile said. She added that showing future students the outcome — a bachelor’s degree from Salem State — can make the journey seem more tangible and achievable. “Everybody wins; the students win; North Shore is going to win, and Salem State will as well,” Keenan said.